The 15 Coolest Houses in Arizona! From iconic architecture to lavish mansions, Arizona is home to some pretty cool houses. There’s the work of the influential Frank Lloyd Wright, Bourgeoisie Paradise Valley communities, and even an underground home. The following homes are signature landmarks that have turned heads and brought in crowds. Here are some of the coolest houses in Arizona. Villa Paradiso made waves when it went on the market early last year. The $35 million listing was featured in The Arizona Republic, Business Insider, and The Wall Street Journal. Nestled on 12 acres of land, it’s a massive mansion with views of Camelback Mountain, McDowell Mountains, and Four Peaks. The mansion includes a 12-car garage, home theater, indoor basketball court, two elevators, and several swimming pools. Robert Sussman, the founder of Bentley Capital Management, owns the 36,000-square-foot mansion. If it sells, it will become the most expensive home purchased in Arizona history. Eccentric architect Frank Lloyd Wright originally built Taliesin West as his winter home. Since his death in 1959, it has become a famous landmark and portal into the psyche of one of architecture’s most famous sons. Wright purchased 160 acres near the McDowell Mountains back in 1938. He transformed it into a modern home, study, and community for his fellowship that still hosts tours today. The Benjamin Adelman House is another Frank Lloyd Wright invention. Constructed in 1952, the house was one of a few commissioned by the Adelman family for Wright. It’s gone through extensive renovations but still showcases some of Wright’s Usonian themes. The Phoenix house resold in 2002 for $1.2 million and is currently a private residence. This 10-acre house is located along the base of Camelback Mountain. Frank Lloyd Wright built the house in 1950 for his son and daughter-in-law. The design features an elevated home and 360-degree views of the mountain. It’s one of Wright’s spiral designs eventually made famous by his construction of the Guggenheim Museum in New York City. Tours and research are still conducted at the residence today. This home was one of Frank Lloyd Wright’s Usonian constructions. The house underwent extensive renovations in the 1990s that have reduced the appearance of Wright’s influence. However, the original Wright design still exists in one wing of the home and attracts many passerby looking to get a glimpse at history. The Jorgine Boomer Cottage is located directly next to the Benjamin Adelman House. This Frank Lloyd Wright product is unique in that it has a cottage style in the Arizona desert. The house was built from desert rubble and wood sheathing and is surrounded by shrubbery and trees. Harold Price commissioned Frank Lloyd Wright to build his 19-story tower. After being pleased with the results, he hired Wright to create this 5,000-square-foot residence. The house is notable in that it was built using concrete block construction, which was innovative at the time. It also has an open-air atrium that creates the appearance of a floating roof. The Norman Lyke’s House was the final home designed by Frank Lloyd Wright. The 2,800-square-foot house is highlighted for its curved design around a mountain and for its use of concentric circles. The house hit the open market last year and has an asking price of $3.6 million. Under the ownership of the Robert Sarver, the Phoenix Suns have fallen to become one of the worst teams in the NBA. However, Sarver’s high profits from ownership are on full display in his Paradise Valley home. 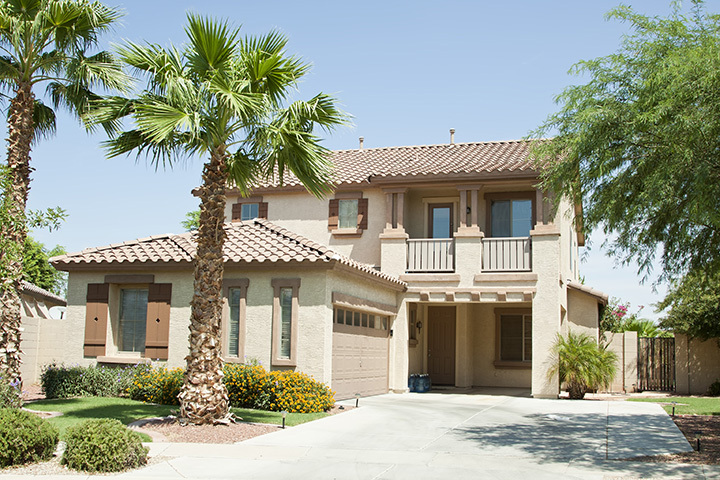 A recent article by azcentral.com valued the house at $14.4 million, second most in the state. The home has a 12-car garage and 12 patios—as well as a replica Phoenix Suns basketball court in the backyard. Phoenicians often see a random castle atop a hill while driving on the Loop 202 highway. That’s the Tovrea Castle—created by Italian Alessio Carraro in 1928. The house is known for its wood and stucco style and for its surrounding cacti. Plans to convert the castle into a state-owned park have halted but the castle still overlooks the sprawling city today. Chewing gum tycoon William Wrigley Jr. built this house as a 50th anniversary gift for his wife back in 1932. The Wrigley Mansion has become a Phoenix landmark for its spectacular views. Located near the Biltmore area and atop a 100-foot knoll, the mansion has 360-degree views of the city and surrounding mountains. The Spanish style mansion is 16,000 square-feet and has 24 bedrooms. It was restored in the 1990s and is now available for tours and special events. The Mystery Castle is a Pride of Phoenix award winner and is listed on the Arizona Historic Register. Bryce Gulley built the castle in the 1940s as a gift to his daughter, Mary Lou. After Gulley’s death, Mary Lou moved into the native stone castle and gave tours until her death in 2010. The castle features 18 rooms, 13 fireplaces, and is fully furnished with southwestern décor. Located in the foothills of South Mountain Park, the Mystery Castle has been featured in a variety of mediums, from HGTV to The New York Times. Eliphante is as much a work of art as it is a house. For 28 years, Michael Kahn and Leda Levant built kaleidoscopic structures on an isolated property in Cornville. The property consists of three acres of outdoor sculptures and artwork created by the couple and friends. The most popular structure, Eliphante, is a half subterranean experimental building. Since Michael’s death, the property is run by the non-profit Eliphante, Ltd. to inspire others through his art. This 52,000-square-foot mansion was once the house of Penzoil heir Walker McCune. The mansion features 14 bedrooms, two elevators, a racquetball court, ballroom, salon, theater, and pool. Complex considers the mansion one of the 25 largest privately owned homes in the U.S.
At 1,800 square-feet, this is the smallest entry on this list. However, what it lacks in size it makes up for in style. The Earth Sheltered House is dome shaped and mostly underground. Innovative light-gathering windows illuminate the rooms. The unique architecture and gorgeous surrounding landscape make it one of Arizona’s best.